Excerpt  "Unity in Action"
King Shaka Celebrations: Address by Mangosuthu Buthelezi, M.P. "Umkhonto We Sizwe - Born of the People"
Freedom Fighters Betrayed By Own Liberation Movements!!! Afrikaner Broederbond: an Afrikaans term meaning 'league of Afrikaner brothers'. Ossewabrandwag: an Afrikaans term meaning 'oxwagon sentinels' or 'oxwagon guard'. Stormjaers: an Afrikaans term meaning 'stormtroopers'. The New Africa - Capitalist or Socialist? Sweep out the crooks and assassins! We repeat: Release our political prisoners NOW! Just how possible is peace? Negotiations: What room for compromise? Is a retreat from National Democratic Revolution to National Bourgeois Revolution imminent? Will the ANC sell-out workers? Buthelezi and the "Zulu Kingdom"
What went wrong in Natal? Reserve Bank - Independent of whom? Challenging the neo-liberal agenda in South Africa. Govan Mbeki was a journalist, Transkeian leader, a significant figure in the African National Congress (ANC) and the underground Communist Party in the 1950s and 1960s, and he was involved in Umkhonto we Sizwe. He was born in 1910 in the Transkei, the son of a chief; his parents were strict Christians. He attended mission schools and completed his BA with a diploma in teaching in 1937 at Fort Hare. Mbeki joined the ANC in the mid-1930s, and committed himself to socialist ideas. In 1940, he earned a B.Econ. in Social Studies through the University of South Africa, and, while in prison in 1970, earned a BA honours degree in economics. Mbeki was both an intellectual and an activist. In 1938 he turned from teaching to local politics and writing. He wrote two books on the conditions in the Transkei, which were published in 1939 and 1964. By 1941 he was actively involved in a number of local and regional organisations, including the Transkei Voters Association, Transkei Organised Bodies, and the Transkei Territorial Authorities General Council, commonly known as the Bunga. In 1955, Mbeki moved to Port Elizabeth and took up full-time political work as a reporter and editor for New Age which was to be the only national newspaper serving the liberation movement until it and its makers were banned in 1962 by J B Vorster, the then Minister of Justice. Mbeki was forced to go underground and plunged into the organisation of the ANC in the Eastern Cape and played an important role in ANC policy-making, even though he was restricted by bans. 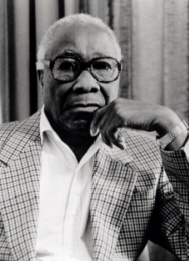 In July 1963 Govan Mbeki was arrested in the Rivonia raid and was sentenced to life imprisonment on Robben Island. On June 26th, 1980 the Secretary General of the African National Congress (ANC), Alfred Nzo, announced the conferring of the time-honoured title of Isithwalandwe on Govan Mbeki. As he was on Robben Island, Mbeki could not be present to receive the highest honour that his people and his movement can bestow on any individual. After being released from prison on 5 November 1987, Mbeki immediately continued with the work of the African National Congress (ANC). Following the 1994 elections he became Deputy President of the Senate. Mbeki died in Port Elizabeth in September 2001. Peter Joyce, A Concise Dictionary of South African Biography (1999). Francolin : Cape Town.